Local resection of colorectal lesions can be achieved through various techniques for instancetransanal endoscopic microsurgery (TEM). The resulting specimen contains the lesion totally, allowing evaluation of radicality. Complication rates are low and irradicality is rare. TEM’s straight instruments limits its applicability to the first 25cm from the linea dentata. Concerns have been expressed because the 4cm diameter rectoscope may effectfecal continence on the long term. Traditional colonoscopic resection is an alternative, applicable in the entire colon. However piecemeal resection hampers histological evaluation of resection margins. Endoscopic submucosal dissection (ESD) and endoscopic mucosal resection (EMR) evolved, allowing retrieval of an intact specimen. Both techniques use single instrument dissection and are associated with hemorrhage and perforation when applied in the thin walled colon. Bimanual dissection, like in TEM, may overcome this because tissue can be presented with one instrument during manipulation by the other. The primary objective of this research is development of ECORES. This bimanual technique on a colonoscopic platform may combine the advantages TEM and present coloscopic techniques. Description of a standard operating procedure and selection of an instrument kit are secondary objectives. A double work channel flexible endoscope (the R-Scope) was applied. This 13mm diameter flexible endoscope is 133cm long allowstwo independently maneuvered instruments. Hydroknife is an instrument thatapplies both hydrodissection and diathermia. Injecting highpressure water raises the mucosa, decreasing the chances of perforation. Subsequent selective diathermia of the submucosal vesselsis possible without changing instruments. Regular endoscopic instruments andthe Hydroknife with different tipswere compared. An initial series of procedures was performed in vitro in a model mounted with bovine rectums. Once the standard operative procedure was formulated in vivo experiments in the porcine model examined the effectivity of hemostasis and the influence of peristalsis. A standardized procedure was developed. Dissection with the T-tipped Hydroknife allowed for the fastest and safest dissection. The rat tooth 19.5mm forceps was the preferred instrument for tissue presentation. During practice sessions the diameter of resected mucosa specimen rapidly increased to 6cm diameter. In vivo, hemostasis proved adequate. However, maintaining oversight proved challenging due to peristalsis. 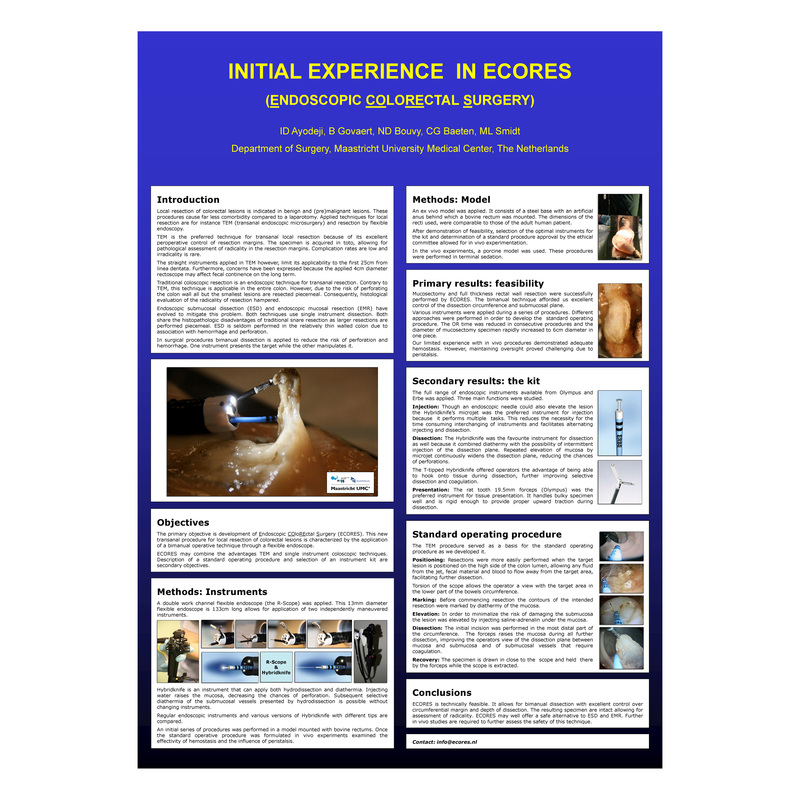 ECORES is technically possible and a standard procedure has been formulated. It allows for bimanual dissection and yields specimen, suitable for the assessment of radicality and may well offer a safe alternative to ESD andEMR. Further in vivo studies are required to further assess the safety of this technique before. Clinical application of ECORES has the potential to offer patients with colorectal lesions both a safe option for local resection and adequate assesment of histological radicality.